If you don't want to get in trouble, stop reading this right now, then close this page and erase your browser history. Do it NOW, because I'm about to commit a flagrant and serious copyright violation and I don't want to drag you down with me. 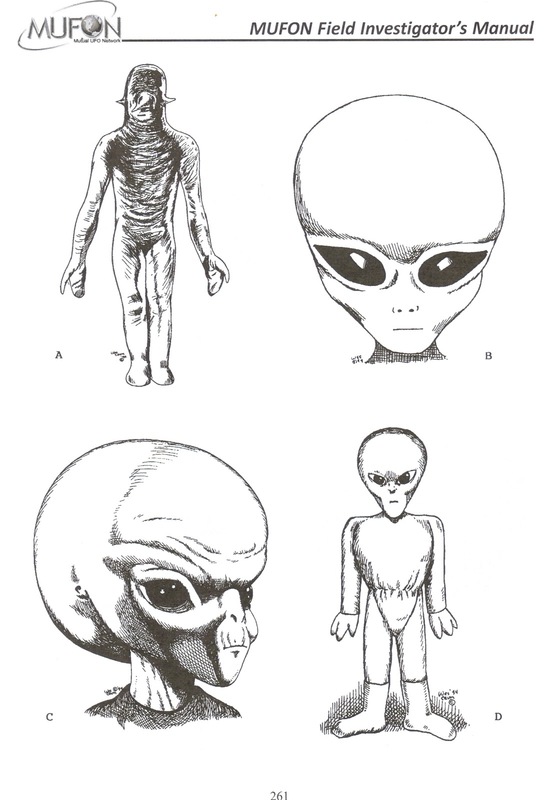 The following images are from the MUFON Field Investigator's Manual, and they are copyrighted. Truth be told, I've been getting a bit bored with my studies. The Manual just goes on and on about investigation techniques and ethics, and it saves all the cool stuff about cattle mutilation and alien encounters until the very end. So, to stave off boredom and to keep myself motivated, I decided to skip ahead. I'm glad I did, because at the end of the "Special Cases: Entity Cases," chapter I came across a treasure trove of alien artwork. It turns out that MUFON has a "Staff Artist," and this staff artist has pulled out all the stops in depicting no less than 16 different types of "entities." Amazing stuff, as you will see. I know all about image A. That's one of the silver-skinned, lobster-clawed dudes that took Charles Hickson and Calvin Parker aboard their UFO in Pascagoula, MS back in 1973. Images B, C, and D are your classic alien "greys" in what seem to be a variety of emotional states, ranging from reserved (B), to peeved (C) to "I'm gonna kill you" (D). (Of course, if you saw entity D, that was probably the last thing you ever saw, so you would not even be participating in this interview). Oh, damn, I bet I just violated copyright by swiping that image of the pain scale! Hurts Whole Lot!